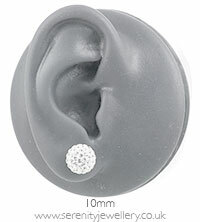 Hypoallergenic Blomdahl titanium crystal ball multi-crystal stud earrings with titanium butterfly backs. 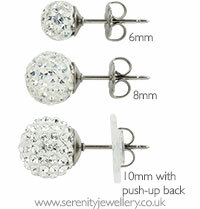 10mm crystal balls have Blomdahl push-up butterfly backs which have a plastic surround to help support larger size earrings. I choose a blue version of these crystal earrings. They are very pretty and easy to wear. Also great fun to mix different colours with outfits. The pale blue is really nice. My daughter loves them although I think they are more special occasion rather than everyday earrings. My daughter has lost the backs of both already after a few weeks but I think that may be her rather than the earrings at fault! I bought these for my daughter for Christmas they look lovely and I am sure she will love them too. Excellent service and delivery very quick. Thank you. 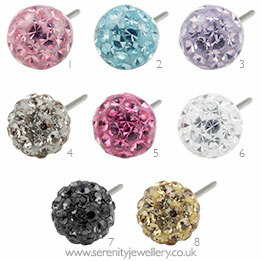 Love this pair of crystal ball stud earrings! They are super sparkly and go well with jeans as well as dresses! I was very disappointed with this purchase. I was very excited to read the reviews and was hopeful that I would be able to wear earrings again. Unfortunately 10 mins after putting them in my ears started to go bright red and I had to take them out. I tried them again a few times as well as once without the backs just in case. I didn't even buy the cheapest & spent almost £30. We're very sorry to hear that. Allergic reaction to titanium are extremely rare (we only tend to hear of them once a year at most) but unfortunately it is possible to be allergic to anything. Stunning for an evening event! These sapphire earrings are stunning, and are great for an evening event! Beautiful!!!!! 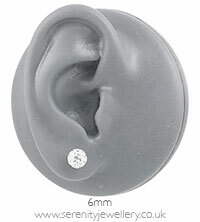 Fab earrings wore them all day without irritation which is a miracle for me!